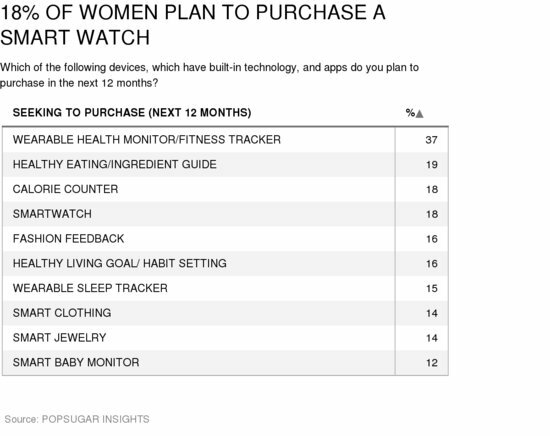 As part of the POPSUGAR Insights "Find Your Happy" study, we asked women to share the wearables, smart devices, and other tech products they currently own and plan to purchase in order to help them keep their lives in order, track their goals, and obtain feedback from others in their social network. 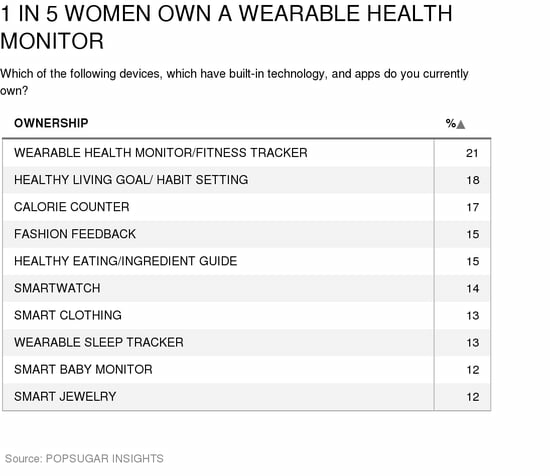 In terms of overall ownership, 21% of women currently own a wearable health monitor and fitness tracker, making that the most popular type of device owned by women. Teen girls are more likely to own wearable mobile workout applications (24%), fashion feedback apps (24%) and smartwatches (19%). Moms are more likely to own healthy eating or ingredient guides (18%) and smart baby monitors (19%). Teen girls are more likely to plan to purchase smart clothing (20%) than any other age segment, and moms are more likely to plan to purchase calorie counters (24%) than non parents (15%). Hispanics are more likely to plan to purchase wearable sleep trackers (23%) than any other ethnicity.